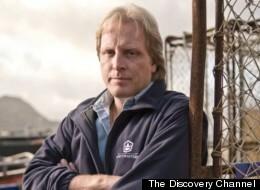 Sig Hansen has been captain of the crab-fishing vessel Northwestern for almost 20 years, and he and his boat have starred on the Discovery Channel’s Emmy-winning reality show “Deadliest Catch” for all 8 seasons. In this candid interview, the captain — widely regarded as one of the crab industry’s top providers — reveals his deepest fear (and no, it isn’t his boat sinking). My first question for you is, what’s your definition of “fearless”? It’s overcoming. That’s all it is. Pushing through. What makes you fearless? Well, I never really looked at myself as fearless, to be quite honest. But it seems like the older I get, the luckier I even feel to be here. So I guess if we’re going to call it “fearless,” then that’s what it is. There’s been many times where you look back and you think to yourself, How in the heck did we manage? How did we get through that?